The Ghana Book Trust [I was going to put it in a link, but it seems their website is down] in collation with the Canadian Organisation for Development through Education (CODE) and the Burt Award for African Literature invites interested persons to participate in a 5-day Writers’ and Editors’ workshop. The workshop is for persons who write for/are interested in writing and working with Young Adult fiction. Resource persons: Kevin Major from Canada and seasoned Ghanaians in the book industry. Registration: phone Winnie on 026-569-9700 between 9am and 4pm. Deadline is 4 September 2014. Good luck to those who participate. The more people who write here in Ghana the better, especially for those who like reading. 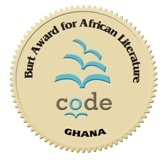 The official ceremony for the 2011 Burt Award for African literature, organized locally by Ghana Book Trust , with sponsorhip from CODE , which took place on 16 July 2012, was a bit different from most book related ceremonies that I have attended here in Accra. Firstly, it started on time. And I was late, thinking 15 minutes past of the official start time would be OK, but it wasn’t! Too bad for me, and a big hurrah for the organizers. TG I wasn’t the latest to arrive though, and I don’t think I missed too much. Secondly, it was pretty short and to the point. Within an hour all the speeches had been done, and it was time for some photos with the winners, or press interviews, or just networking with friends and colleagues. Thirdly, there were no books available for sale. A disappointment actually, though I did know in advance that this was just the award ceremony itself. What further saddened me though was hearing that the books would not be published until November this year, which is definitely later than expected! But then I shouldn’t complain; that means that there is something to look forward to! All are being published locally, and 3000 copies of each title will be distributed to schools, libraries and other institutions, so they will be widely available. Note: There was press coverage in both the Ghanaian Times and the Daily Graphic, but not a huge amount online. See here and here. 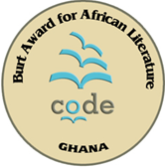 Although I have never attended any of the formal ceremonies where the Burt Awards for African Literature have been formally presented [does this sound like a hint to the future organizers? I leave to your imagination! ], I do feel that it is worth promoting , so that teenagers here in Ghana may have access to a wider range of fiction which is contemporary, exciting, and relevant to their own lives. Most of the following is taken from an advert in the Daily Graphic [though with some spelling mistakes and omissions] of Tuesday 28 February 2012, but further details are available from the Ghana Book Trust, whose contact details will be listed below. Manuscripts should be submitted to the Ghana Book Trust in one soft copy and five hard copies by 29 June 2012 at 4pm. There is also more information on the Ghana Book Trust website. All the best to the authors and publishers!